The documentaries will be distributed by various means. One of the ways by which I am sure they will be distributed eventually has very much to do with an important evolution in communications history which will take a little describing. […] With two-way TV we will develop selecting dials for the children which will not be primarily an alphabetical but a visual species and chronological category selecting device with secondary alphabetical subdivisions. The child will be able to call up any kind of information he wants about any subject and get his latest authoritative TV documentary, the production of which I have already described to you. You are invited to use your two-way TV to dial-in your superb fundamental conceptioning and information. Join 4D Syndicate, the first Google Wave for Buckminster Fuller. Real-time communication occurs at various times on the second day of each month. Synchronofile has a limited number of invitations to Google Wave available for the first few who request them. Paper model of the 4D House. Work in progress. Trevor Blake, October 2009. See models of the 4D House in our gallery and in a 3D video. 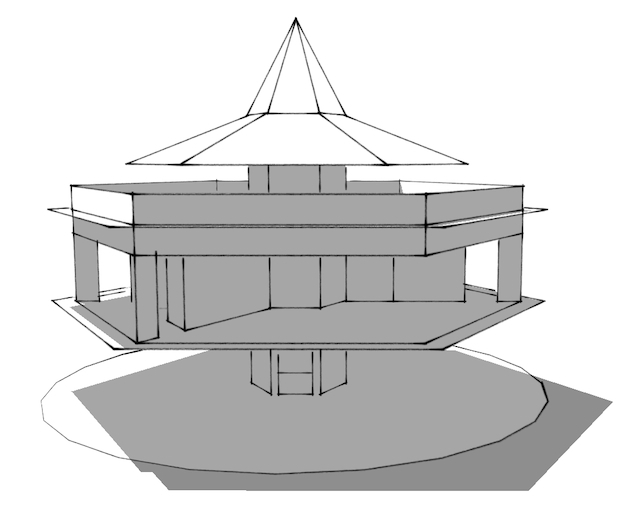 Buckminster Fuller’s 4D House in three dimensions. A work in progress by Trevor Blake of synchronofile.com. Silent, B/W, 30 seconds. If Buckminster Fuller is known for any effort, it is the effort to provide shelter. But who did Fuller actually provide shelter for? The Lightful House and 4D House existed only on paper. The Dymaxion House existed only as a small scale model. The Dymaxion / Wichita House existed as two full-scale models (one internal, one external, neither able to be connected to the other). The Dymaxion Deployment Unit did house a small number of US armed forces personnel but the DDU was the invention of Victor C. Norquist, not Buckminster Fuller. 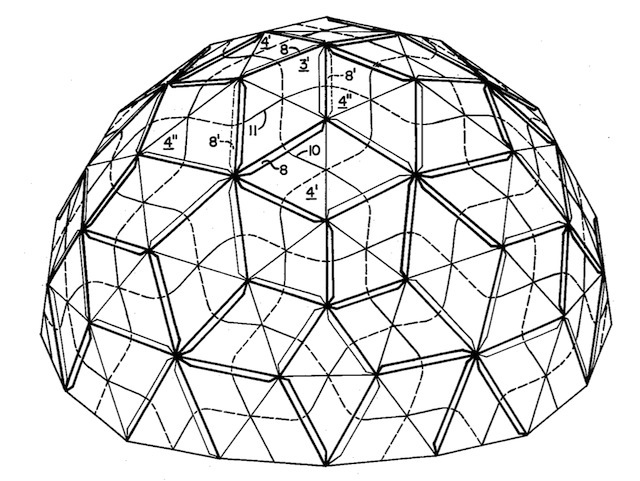 The geodesic dome was invented by Walter Bauersfeld. Of the dozens of books by and about Fuller, of the thousands of articles on his life and work, most of them fail to give a single instance of when Fuller actually provided shelter to anyone. 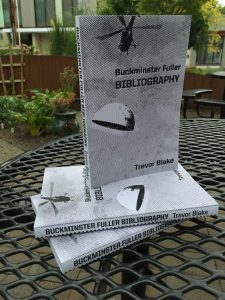 The Buckminster Fuller Bibliography by Trevor Blake is the first book to document that Fuller provided shelter for others with his own direct effort. The New York Times for 10 September 1932 includes an uncredited article titled “Single Jobless Men to Get Lodging House / Social Worker and Engineer Obtain Use of Tenement for Those Ineligible for City Aid.” The building in question was a then-deserted seven-story building located at 145 Ridge Street in New York City, New York. The social worker was Ben Howe and the engineer was Buckminster Fuller. Fuller is described as “editor of the magazine Shelter and head of Structural Study Associates, an engineering firm.” According to the article, the men who were renovating the building were hoping to live in it afterward. They were otherwise ineligible for benefits because they were not the head of a family. The building was to house two hundred and fifty men at a time and serve several thousand during Winter. Lieutenant R. E. Johnson was also involved in this project. He is described as a “former army construction engineer and commander of the United States Ex-Service Men’s Association.” At the time of the article, the shelter was under construction. The building described in this article no longer exists. The New York Times for 2 December 1932 includes an uncredited article titled “Jobless Veterans Back in Barracks / 300 Single Men to Live Under Military Rule in Converted Clubhouse in 54th St.” The building in question was a five-story converted boy’s club at 340 East 54th Street in New York City, New York. According to the article, the shelter would be run by and for veterans and in a military style. The shelter would serve single men because of their difficulties in obtaining relief from existing services. The plan was initiated by a meeting of representatives of various interested organizations at the office of Raymond V. Ingersoll. Ingersoll served as a New York Parks Commissioner and as a Brooklyn Borough President. A residential development named after Ingersoll stands today at 120 Navy Walk in Brooklyn, New York. The representatives at the meeting included Ben Howe and Buckminster Fuller of the 145 Ridge Street shelter, Philip Hiss, Colonel Walter L. DeLamater, Arthur Huck, Louis Gleich, Owen R. Lovejoy, Cyrus C. Perry, James R. Sichel and Henry C. Wright. Philip Hiss went on to design and build homes in Florida, although he was not a trained architect. Col. DeLamater served in the 71st Infantry Regiment, an organization of the New York State Guard. Arthur Huck worked on numerous homeless shelter projects in the New York area, as reported in decades of articles found in the New York Times. Louis Gleich was a commander in the New York County Council of the Veterans of Foreign Wars and was the chairman of the committee that erected a VFW monument in Union Square. Owen Lovejoy served as the General Secretary of the National Child Labor Committee. The building formerly housed the Kips Bay Boys’ Club, where Lovejoy served as secretary. 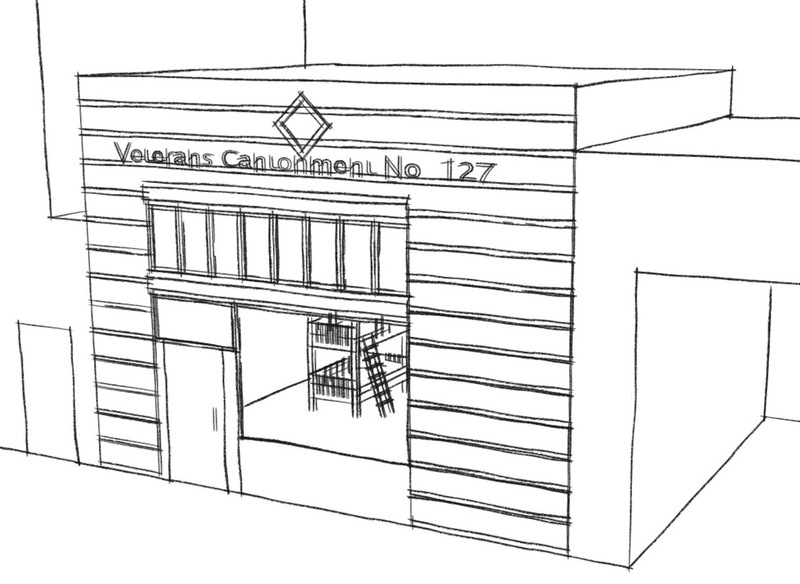 The building was to be called Veterans Cantonment No. 1. At the time of the article, the shelter was in operation. The building described in this article may still exist, next to the building that currently is designated as 340 East 54th Street. By 1932, Buckminster Fuller had published drawings of his 4D House and exhibited models of his Dymaxion House. He had been featured in the Chicago Evening Post, Fortune Magazine, the Harvard Crimson, Modern Mechanics Magazine, the New York Times and Time Magazine. Fuller had published his monograph 4D and was publishing Shelter Magazine. He had earned the rank of Lieutenant Junior Grade in the United States Navy. In 1933 Fuller would begin work on the Dymaxion Car. Fuller, R. Buckminster. I Seem to Be a Verb. New York: Bantam Books, 1970. “Louis Gleich, 69, Dies.” New York Times [New York City, New York] 26 Sept 1961: 39. “Philip H. Hiss 3d, 78, Designer of Buildings.” New York Times [New York City, New York] 4 November 1988: B4. Sieden, Lloyd S. Buckminster Fuller’s Universe. Cambridge: Perseus Publishing, 1989. Fuller’s first invention was a 1907 push-pull boat propeller. As a child Fuller would use a rowboat to travel. To be able to propel himself while facing forward, he imagined an umbrella on a pole that could open and close as he pushed it into and pulled it out of the water. It is unclear if this invention was made or imagined, but there is a drawing of it in The Geodesic Works of Richard Buckminster Fuller by Yunn Chii Wong. The Stockade Building Structure was co-invented by Fuller. The Stockade Pneumatic Forming Process was invented and patented by Fuller. The 4D House is a house which, instead of resting on the ground, is suspended from a central mast. The 4D House has no patent. Inventions claims the patent was submitted in 1928, rejected, and Fuller did not re-submit out of ignorance that this was an option. Fuller does not state why he did not re-submit when he learned that this was an option. Inventions also claims the 4D House patent is rectilinear like a conventional house because his unnamed patent attorney advised him it would be more convincing to the patent examiners. The illustrations of the 4D House in Inventions are generally of a hexagonal building rather than the rectilinear building in the patent itself. Dymaxion World calls the hexagonal 4D House the “clean-up model” in illustration 40 and is seen in illustrations 40-41 and 49-64. 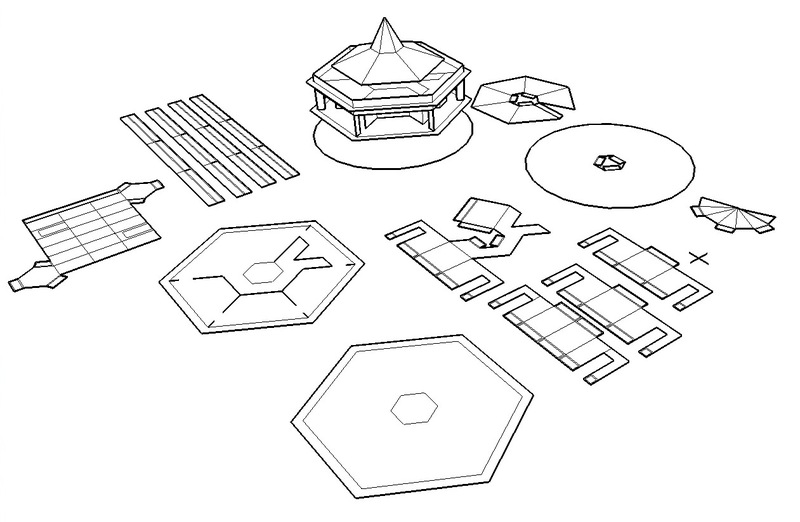 Variations of the hexagonal 4D House are seen in Dymaxion World illustrations 2, 16-39 and 66. In Buckminster Fuller’s Universe, Sieden writes that Fuller offered the rights to the 4D House to the American Institute of Architects as a gift and that this gift was rejected. According to Becoming Buckminster Fuller, Fuller was not ignorant of the patent process because he did pursue it before, at the time and afterwards. The patent for the 4D House was abandoned because of the 43 claims made in his application, all 43 could be found in earlier patents. 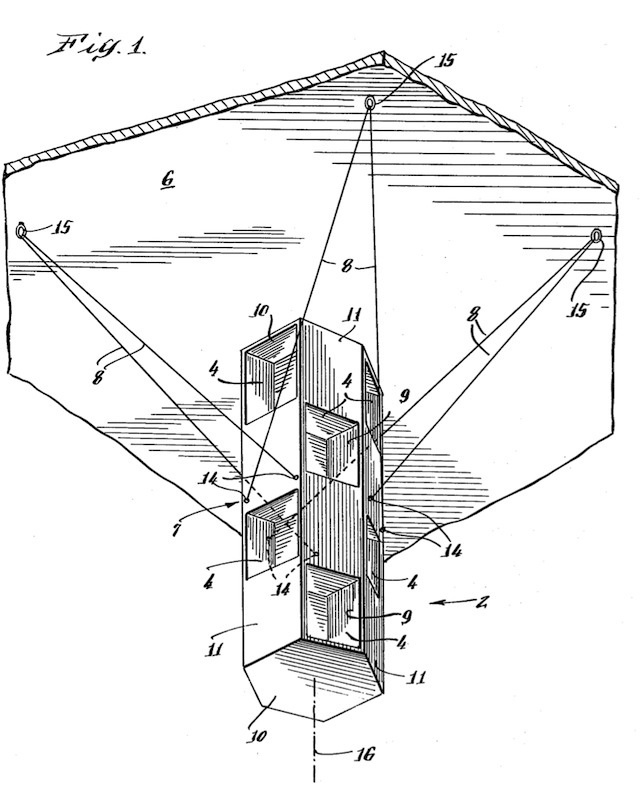 Attorney D. H. Sweet is blamed for the rectilinear 4D House in his patent application but Fuller’s own sketches to this point had been rectilinear. The 4D House is preceded by similar inventions. The Dymaxion Car is a three-wheeled automobile. The Dymaxion Car is called a Motor Vehicle in patent 2,101,057 (7 December 1937). 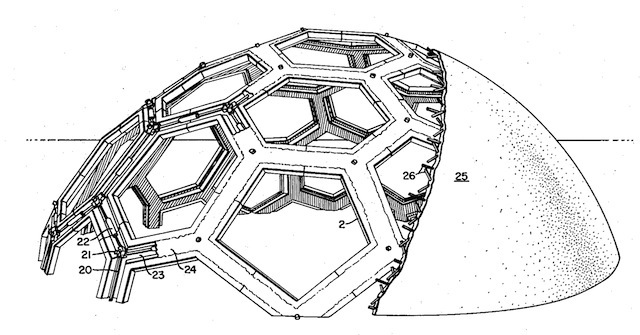 The patent was assigned to Buckminster Fuller. Inventions includes the Great Britain patent for the Dymaxion Car. Fuller was the Director and Chief Engineer of the Dymaxion Corporation. The patent drawings most closely resemble Dymaxion Car #1, but two different Dymaxion Cars were produced and two more yet were conceived. In 2010, automobile restoration company Crosthwaite and Gardiner produced Dymaxion Car #4, based primarily on Dymaxion Car #2. The photograph on pages 32-33 of Inventions shows Dymaxion Car #1 outside the Dynamometer Building of the Locomobile plant in Bridgeport, Connecticut. Locomobile produced cars from 1899 to 1929. This is the building that produced the first three Dymaxion Cars. The building was leased by W. Starling Burgess. Burgess produced a yacht in the building while contributing to the creation of the Dymaxion Car. The automobile in the upper left corner is a Franklin. Artist Diego Rivera is seen between the car doors with his jacket in his arms. The earliest newspaper and magazine articles on the subject tend to favor W. Starling Burgess as the main force behind the Car. The Dymaxion Car is first mentioned in print in the New York Times on 1 June 1933. It is described as the creation of W. S. Burgess. The last sentence of the article reads: “Buckminster Fuller, New York architect and engineer, is associated with Mr. Burgess in the project.” By 22 July the New York Times comes to describe Fuller as the inventor of the Dymaxion Car and Burgess as the designer. The magazine Modern Mechanix of October 1933 lists Burgess and Fuller as co-designers of the Car. On 22 October the New York Times described the vehicle as the “streamlined, three-wheeled Gulf-Dymaxion Car, designed by W. Starling Burgess and Buckminster Fuller.” At the time, Gulf Oil had purchased advertising space on the side of the Car. Dymaxion World describes Burgess as “an assistant” in the project. The Morgan Motor Company had been producing three-wheeled vehicles in the USA since 1909. The Burney, produced by Streamline Cars, used aviation design principles as early as 1927. The Chrysler Airflow was a streamline, drag-reducing car of 1934, as was the Tatra T77 of 1935. The Dymaxion Car is preceded by similar inventions, although there is no indication that Fuller was aware of them. The public record initially credits Burgess as the inventor of the car, then credits Burgess as a co-inventor with Fuller, then Fuller in the lead with Burgess as an assistant, and finally Fuller alone. Fuller seems to have had some role in the development of disc brakes during his employment at Phelps Dodge in 1937. Buckminster Fuller’s Universe describes Fuller’s invention as “a revolutionary solid bronze drum fitted with rubber insets to dissipate heat very rapidly, thereby solving [problems] which had plagued automobile and truck breaking systems for decades.” His new breaks also cut stopping times by nearly 50 percent and were the forerunner of the now-popular disc breaks. Grunch of Giants describes this invention as “carbon blocks-inserted, copper disc-brakes” that were “successfully demonstrated” in 1937. BuckyWorks claims that Fuller had considered disc brakes for the second Dymaxion Car (circa 1934). Fuller’s contribution to disc brakes is underdocumented. Another 1937 Phelps Dodge invention of Fuller was a bunsen-burner-melted, water-cooled centrifuge for processing low-grade tin ore. This is mentioned in Grunch of Giants but does not appear in Inventions or Dymaxion World. What this invention might be and its impact on the world has yet to be documented. The Fog Gun is a misting showerhead. The Fog Gun appears in Dymaxion World illustration 88-92 but not in Inventions. Grunch of Giants claims the Fog Gun was designed in 1927 and prototyped in 1949. Dymaxion World, Buckminster Fuller’s Universe and other sources quote Fuller claiming that while in the Navy he was able to clean grease off his hands by the mist eternally surrounding ships at sea. The fog gun is mentioned in Fuller’s 1938 book Nine Chains to the Moon. The fog gun was a means of directing atomized water under pressure for hygiene purposes. Dymaxion World claims the fog gun was tested at the Institute of Design in Chicago in 1948 “and subsequently at Yale and other universities.” In these tests a one-hour “massaging pressure bath” used one pint (.47 liters) of water. In session 11 part 2 of Fuller’s 42-hour lecture “Everything I Know,” Fuller claims professional dermatologists were consulted in researching the fog gun. Dymaxion World continues by saying “If fog gun bathing were done in front of a heat lamp, [all the effects of bathing] could be effected without the use of any bathroom. Since there would be no run-off waters, tons of plumbing and enclosing walls could be eliminated, and bathing would become as much an ‘in-the-bedroom’ process as dressing.” Buckminster Fuller’s Universe claims the test of the fog gun found it to be “a completely satisfactory system of cleansing, which, in fact, caused less damage to skin than ordinary soap and water. Thus, another significant artifact was created and left until a time when future generations would require it.” There is no record of Fuller seeking a patent for the Fog Gun. A mist nozzle inside the basin can produce mist which is mixture of water and soap to wet our hand. Later, water nozzle will spray water with medium velocity to clean our hand. […] High velocity water can helps in cleaning our hands, like the high pressure jet that we use in industrial for cleaning purpose, but in a small scale and lower pressure. […] Compare to common water tap, it is more clean and convenient because the user will never contact to the tap which had a lot of bacteria. […] There are only 1% of water is clean, it will be a serious issue in the future about the usage of water. So, this mist washer can reduce the usage of water to minimum because of the high pressure water nozzle. Compare to common water tap, mist washer is more environmental friendly. Fuller’s Fog Gun is an invention whose generation may have arrived. The Dymaxion Bathroom is a metal one-piece bathtub, sink and toilet. 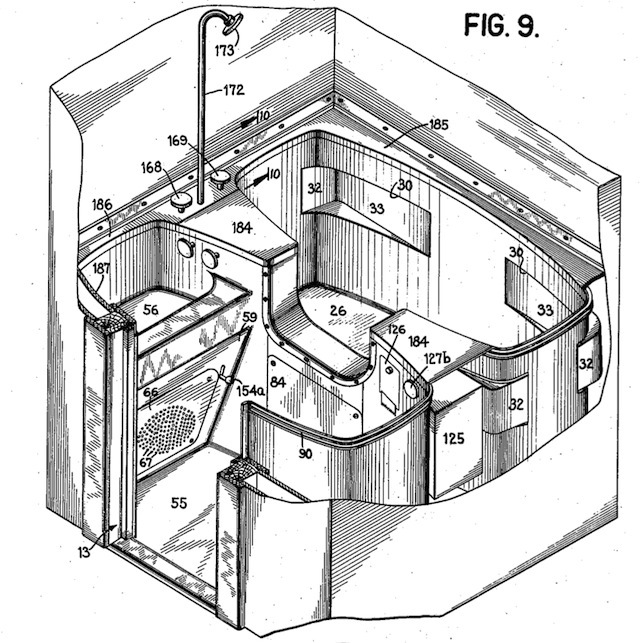 The Dymaxion Bathroom is called a Prefabricated Bathroom in patent 2,220,482 (5 November 1940). Grunch of Giants claims the Dymaxion Bathroom was designed in 1928, prototyped in 1936 and “mass-produced in polyester fiberglass in West Germany, 1970.” In 1936, Phelps Dodge wanted to expand their operations from mining copper to manufacturing copper products. Fuller was hired by Phelps Dodge as a director of research and allowed to pursue any area of interest he chose. Among his work for Phelps Dodge was the Dymaxion Bathroom. Earlier patents for a prefabricated bathroom include Orville Smith’s 2,131,124 (30 October 1938), Samuel Samelow’s 2,087,121 (13 July 1937), Ralph Otwell’s 1,931,392 (17 October 1933), Owen Ayer’s 1,763,209 (10 June 1930) and others. The Dymaxion Bathroom is preceded by similar inventions, although there is no indication that Fuller was aware of them. In Dymaxion World, Fuller claims that the use of red and blue handles to indicate hot and cold running water comes from the Dymaxion Bathroom. Fuller did not claim to invent chemical toilets but he did suggest that the Dymaxion Bathroom could package waste to be picked up with other household waste and re-used by industry. This suggestion precedes the popularity of curbside recycling by decades. The Mechanical Wing was a trailer-drawn mobile home, described in the October 1940 issue of The Architectural Forum. The Mechanical Wing included Fuller’s Dymaxion Bathroom and Fog Gun as well as the usual amenities of a mobile home. 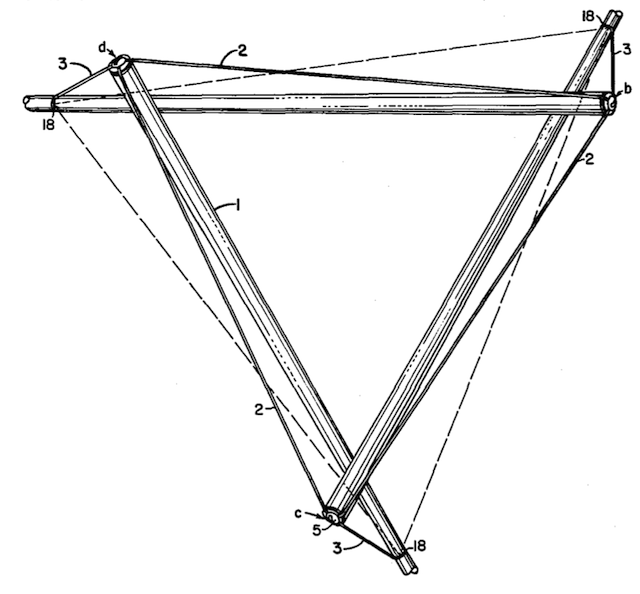 In Dymaxion World Fuller emphasizes that his invention was the cylindrical metal A-frame trailer of the Mechanical Wing, an invention later “popular as a trailer frame for transporting boats.” A similar A-frame trailer had been patented by P. L. Melanson in 1930 as Trailer for Vehicles (1,779,887). The Mechanical Wing is preceded by a similar invention, but there is no indication Fuller was aware of it. The Dymaxion Deployment Unit is a grain bin repurposed as a human shelter. 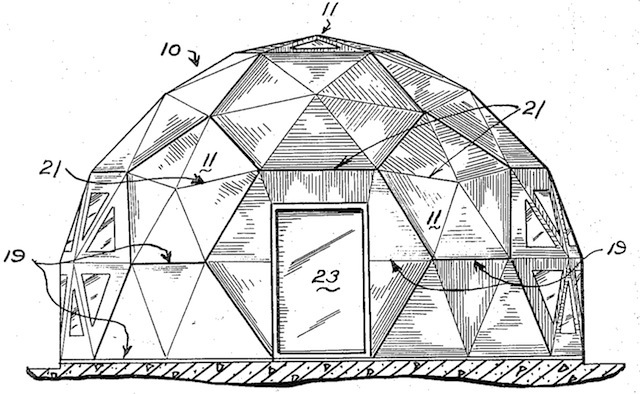 The Dymaxion Deployment Unit (sheet) is called a Building Construction in patent 2,343,764 (7 March 1944). 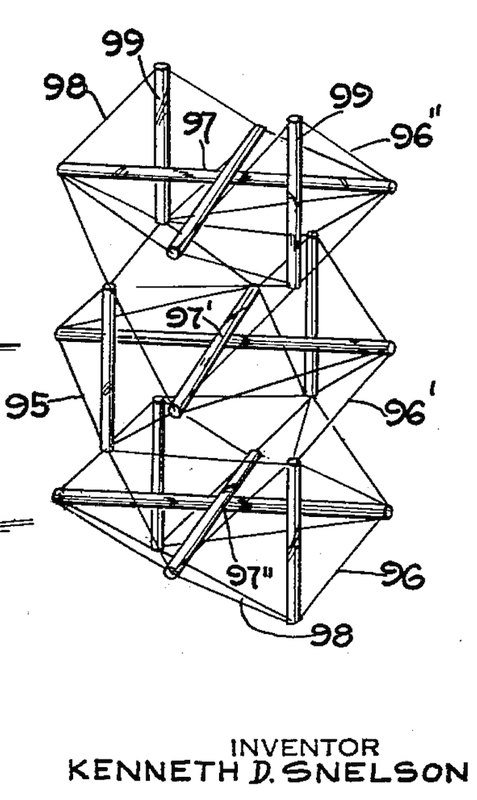 The Dymaxion Deployment Unit (frame) is called a Building Construction in patent 2,351,419 (13 June 1944). Fuller was the Director and Chief Engineer of the Dymaxion Corporation. Dymaxion World illustration 167 identifies the photograph on pages 54-55 of Inventions as having been taken in Haynes Point Park, Washington DC in April 1941. The photograph on page 61 of Inventions appears again with an exterior shot in Dymaxion World images 163 and 164. The photograph on page 68 includes Walter Sanders (head of the Department of Architecture at the University of Michigan) and his wife. The couple lived in the DDU for an unspecified period of time according to Dymaxion World. Dymaxion World emphasizes that Fuller modified the roof of an existing grain bin, giving it a more curved surface. This modification appears to be the basis for Fuller’s claim to inventing the Dymaxion Deployment Unit. 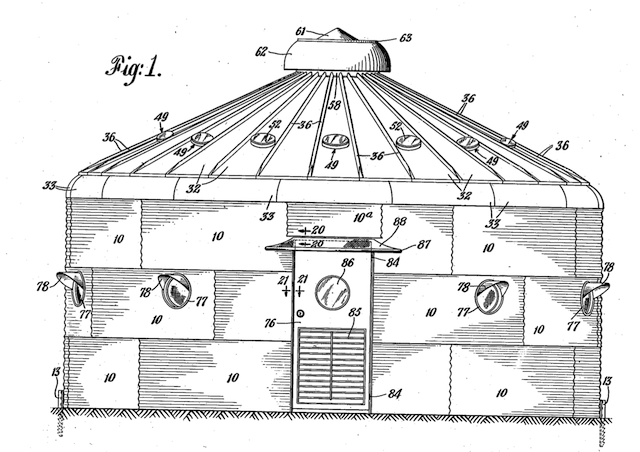 Two patents related to the Dymaxion Deployment Unit have a questionable history. 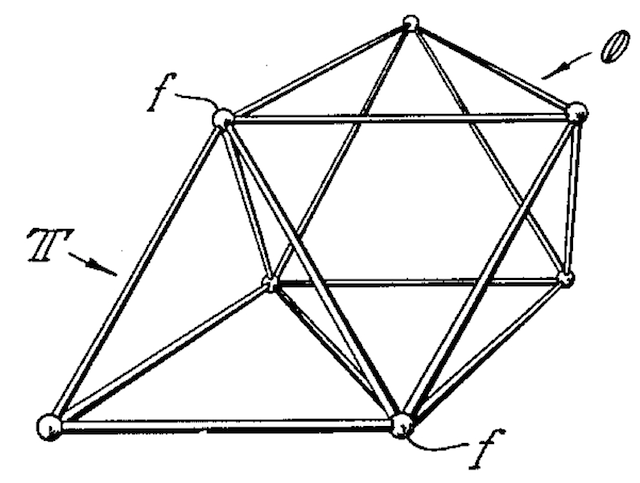 Fuller’s Design for a Prefabricated House 133,411 does not appearing in Inventions. 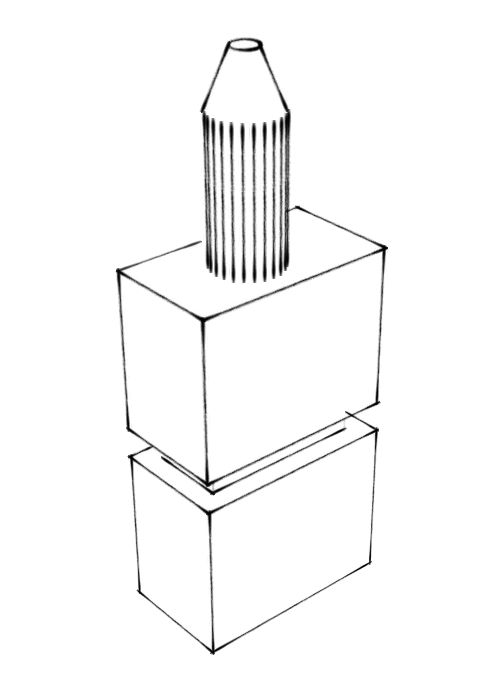 This patent is a near-identical copy of Design for a Prefabricated House 133,418 filed by Victor C. Norquist. 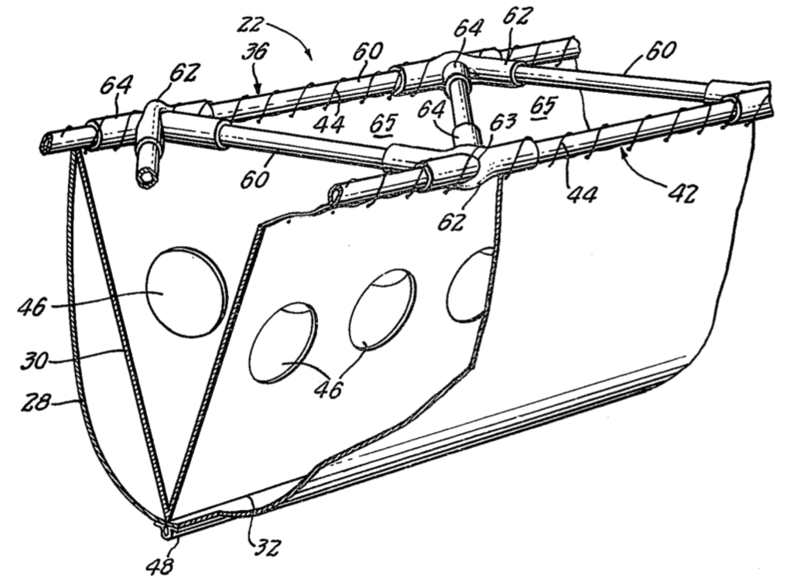 Norquist had dozens of patents to his credit. 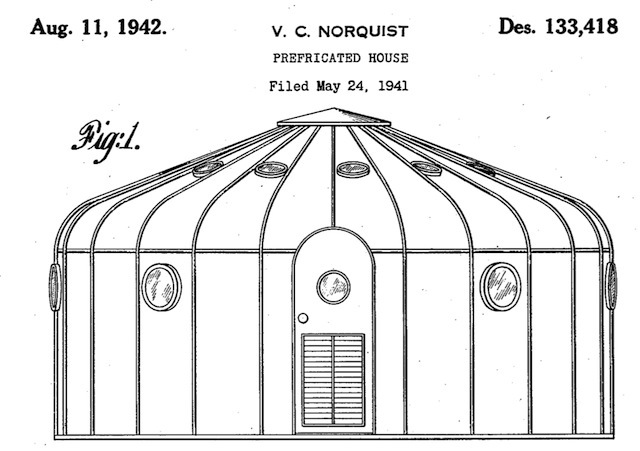 Many of Norquist’s patents were assigned to Butler Manufacturing, which produced the Dymaxion Deployment Units. 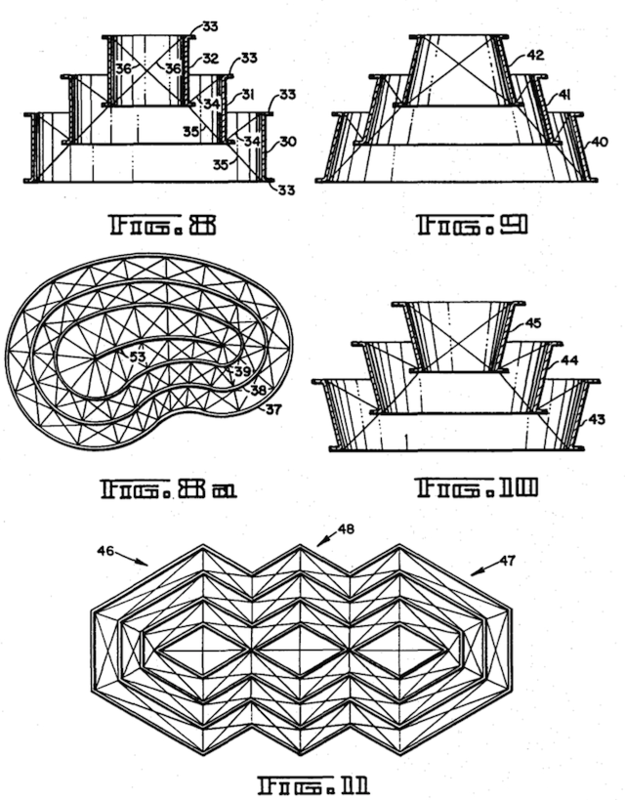 Norquist’s patent reads: “Be it known that I, Victor C. Norquist […] have invented a new, original and ornamental Design for a Prefabricated House of which the following is a specification… ” Fuller’s patent reads: “Be it known that I, Richard Buckminster Fuller […] have invented a new, original and ornamental Design for a Prefabricated House of which the following is a specification… ” The texts of 133,418 (Norquist) and 133,411 (Fuller) are nearly identical and the illustrations are nearly identical. Both patents are awarded on the same day, 11 August 1942. Norquist filed on 24 May 1941 and Fuller filed a week later on 31 May 1941. Norquist’s patent was awarded two years before either of Fuller’s Dymaxion Deployment Unit patents appearing in Inventions. 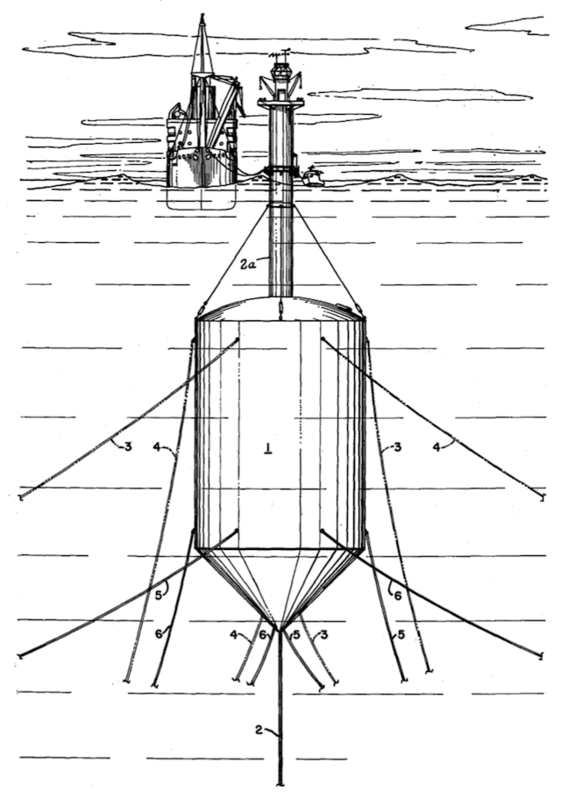 The Dymaxion Deployment Unit is preceded by similar inventions. 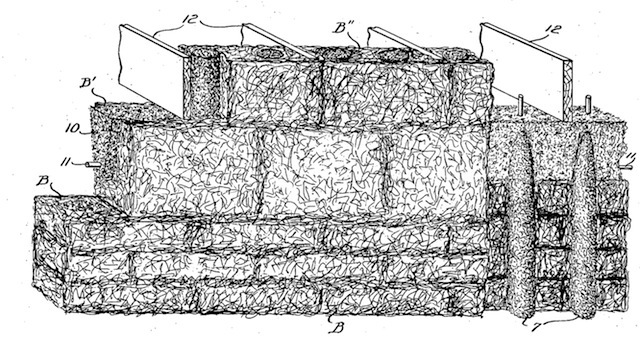 Fuller’s patent is a copy of Norquist’s patent. Fuller’s claim that zones of temperature influence history can be found in Life magazine for 1 March 1943. Fuller claimed that the major centers of industrial civilization lie within ten degrees of freezing, and this was the optimal temperature zone for human beings, and that as those who dwelled there were optimized they dominate the territories and people outside that zone. The Buckminster Fuller Institute wrote in 1992: “Buckminster Fuller then realized that: (1) the colder an area gets the larger the fluctuation in temperature is to be found, and (2) the more a geographical area’s temperature varies, the more technologically inventive must humans living there become in order to survive. (For example, they must learn to build boats to cross a lake in summer, as well as design sleds to cross the ice in winter. )” Fuller’s idea explains disparities in inventiveness and political success that does not rely on race, preceding Guns, Germs and Steel by Jared Diamond by fifty years. The peoples of Europe and Asia have more inventions and political success than those of Africa because there is more temperature variation in Europe and Asia than in Africa. In the past, temperature variation in Europe and Asia necessitated inventiveness that led to political and economic success. Fuller’s zones of temperature explanation for historic disparities is unique. The Dymaxion Profile of Industrial Revolution is a chart of technical progress and a proposed law for that progress. The Profile was first presented by Fuller in Washington DC in 1943. Fuller noted that the period of time between the identification of individual elements has decreased. Between the 1500s and the 1700s, only a dozen elements were identified. Starting in the 1700s, the number of elements identified increased rapidly. 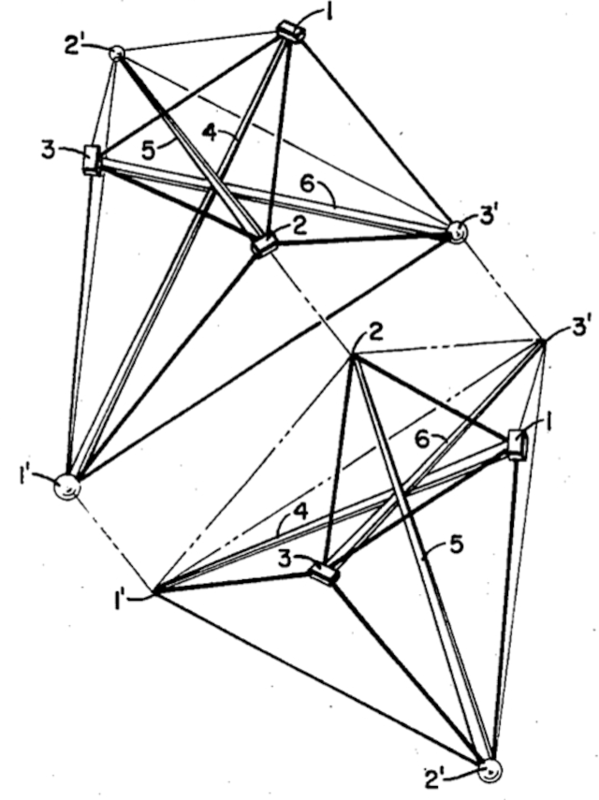 Fuller proposed that two laws of technological progress follow this geometric rise in the number of elements identified. First, as more elements are identified there are more technological discoveries and that these discoveries are also made with greater frequency. Second, discoveries follow a predictable trajectory from the laboratory to the home. In Dymaxion World Fuller describes the trajectory as “pure science paces applied science, applied science paces technology, technology paces industry, industry paces economics, economics pages the social, political, everyday catch-up.” In his 1936 book Nine Chains to the Moon, Fuller makes a similar claim in the chapter title ‘E=mc2=Mrs Murphy’s Horse-Power.’ The discoveries of Einstein, as abstract as they may be, will soon have practical applications in the household of an average American housewife.